This is one of several blogposts in Datalab’s ‘Who’s left’ series of posts. The full series can be found here. Today we are publishing the findings of a major piece of work we have carried out looking at pupil moves and the impact on secondary school results. Our investigation into the issue and the children affected is in response to persistent claims that a minority of secondary schools in England use pupil moves to boost their league table results. 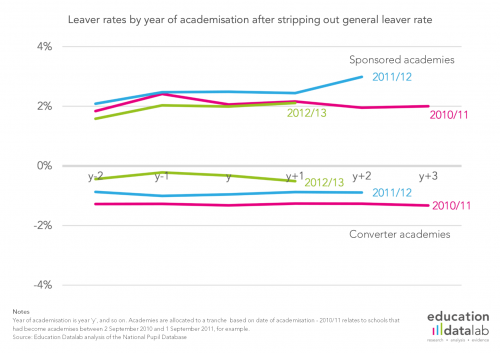 sponsored academies tend to lose more pupils after becoming an academy. No such trend is true of converter academies. Broadly speaking, secondary school league tables are about who’s left on-roll in the January of pupils’ Year 11 year. Our research leads us to conclude that, in some cases, pupils are being ‘managed out’ of mainstream schools before this point with the effect of boosting the league table performance of the school which the pupil leaves. The 2015 education white paper proposed that schools should be accountable for the results of pupils who they send to alternative provision or exclude. But there were only 4,790 formal permanent exclusions in the 2014/15 academic year, when there are around 32,000 cases a year of pupils leaving from the rolls of England’s mainstream state secondaries. We are therefore calling for the DfE to consider whether league tables should be reweighted, so that they are accountable for all pupils who have spent time with them, in proportion to the amount of time spent there. In total, looking at the year group who finished secondary education in 2014/15 there were around 87,000 pupil moves during these children’s time at secondary school. The table below shows how these are split between moves to mainstream schools, state alternative provision, studio schools, UTCs and studio schools, or other destinations – we’ll come back to this final group shortly. 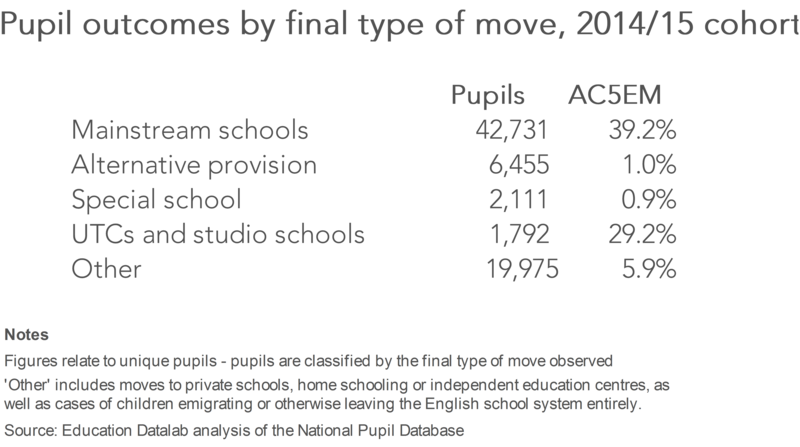 As the table below shows, outcomes for each type of mover are worse on average than they are for pupils in general who finish their secondary education at a state mainstream school (nationally about 57% of children in mainstream schools achieved five A*-C GCSEs or equivalents including English and maths – AC5EM – in 2014/15). Leavers to alternative provision and special schools have very low rates of achieving five good GCSEs or equivalents, at around 1%, but there is another group who are discussed even less, and yet who are much greater in number and also have very poor outcomes – those leaving to ‘other’ destinations. There were 19,975 of these children, and less than 6% achieved five good GCSEs. ‘Other’ encompasses a range of things, but relates to pupils who leave the rolls of mainstream secondary schools and are never recorded as being on-roll at a state-funded secondary education institution – of whom there were 19,975. In what we think is a minority of cases, the child will have left England, while in an even smaller number of cases the child could have died. In most cases, though, these children will be receiving an education at a private school, independent alternative provision, an independent special school, or in further education – or be being home-schooled, or attending unregistered education settings. But while these children should be receiving an appropriate full-time education somewhere, data on the outcomes of this group shows very few are reaching the standard of achieving five good GCSEs. 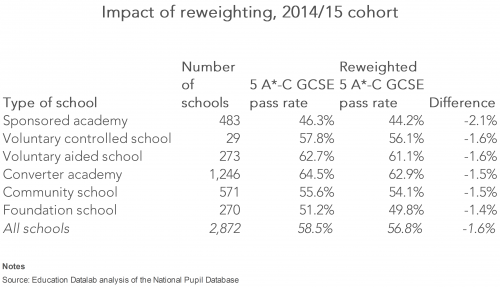 We have produced reweighted league tables that allocate pupils’ results to schools based on the amount of time they spent there. 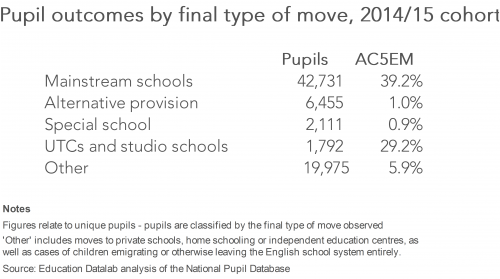 Our reason for doing this is to explore the impact which pupil moves have on a school’s results, as the number of leavers from mainstream secondary schools varies markedly. 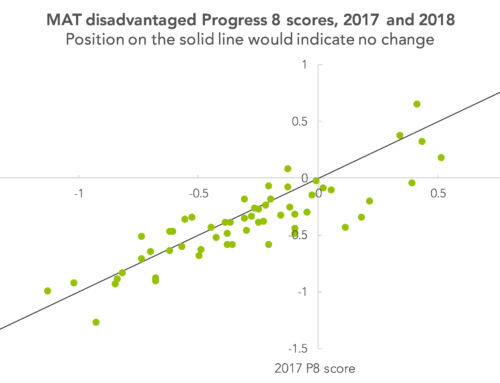 Where schools lose large numbers of pupils, and those pupils go on to have poor outcomes, results under our reweighted approach will be worse than they appear at present, particularly if the pupils left very late during their secondary education. Doing this, there are schools where the impact is as great as 17 percentage points – a school’s headline GCSE pass rate dropping from 61% to 44% in one case. 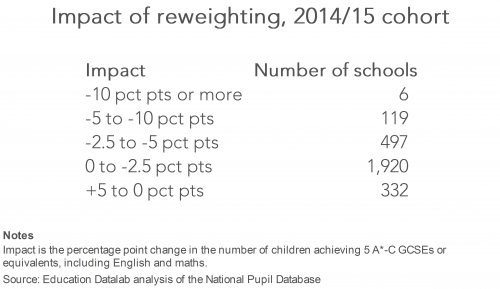 The table below shows a breakdown of the impact of reweighting, looking at the year group who finished secondary school in 2014/15. 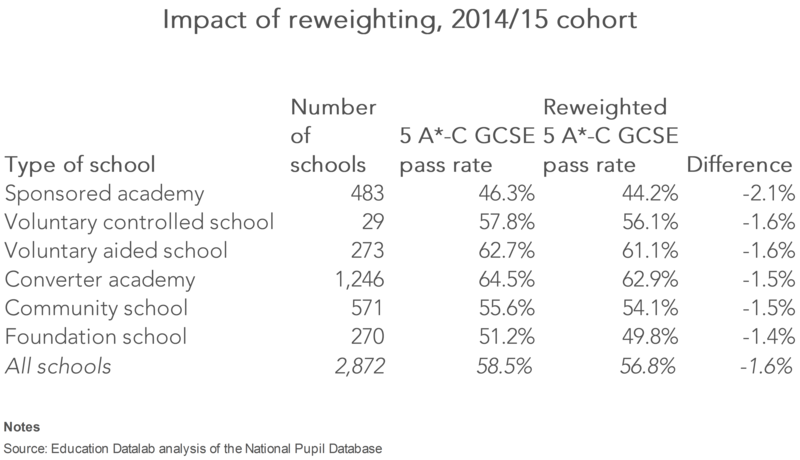 In total, 125 schools’ headline pass rates were five percentage points or more lower in the reweighted league tables. Several sponsored academies are among the schools that would see the biggest impact under our reweighting approach. And, looked at as a group, sponsored academies would see the biggest impact if league tables were reweighted. But different types of schools have quite different characteristics, so a comparison between different school types isn’t overly meaningful. We know for starters that sponsored academies have tended to be lower performing schools in their recent history, for example, and are likely to serve different areas to other types of school. We can, though, look at the number of leavers from a school before and after it converts to sponsored academy status – which should make for a more meaningful comparison, as many of the key characteristics of the population which a school serves will stay the same pre- and post-academisation. 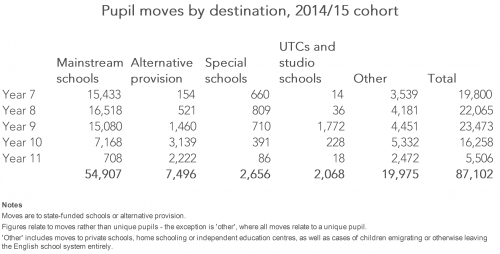 We looked at 149 schools which became sponsored academies in the period 2010/11-2012/13 – meaning we have between one and three years’ worth of data on pupil moves after they became academies. Of the schools that became sponsored academies in this period, leaver numbers were between 0.6 percentage points (a leaver rate of 5.4%, up from 4.8%, 2010/11 academisations) and 1.3 percentage points (6.4%, up from 5.1%, 2011/12 academisations) higher when we compare the number of leavers two years before a school became a sponsored academy to the latest year for which we had data. Over the time period looked at there was a small increase in the number of pupil moves in general. 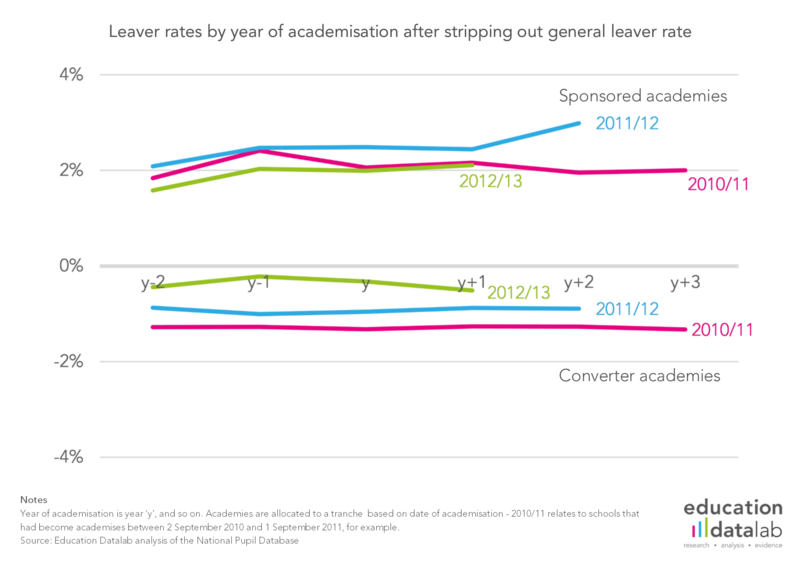 Stripping this out, leaver rates still ended up higher by between 0.2 (2010/11 academisations) and 0.9 percentage points (2011/12 academisations) – translating to between 40 additional leavers per year at the 32 schools looked at that academised in 2010/11, and 340 additional leavers per year at the 53 schools looked at that academised in 2011/12. No such trend was apparent for converter academies. This could have been influenced by things such as the housing benefit cap – brought in in 2013 – and the opening of more alternative provision and special schools in some parts of the country in recent years, but we think it is also driven by changes in policy at individual schools. We’ve taken a decision not to publish the reweighted league tables which we have produced, and to name individual schools, as in individual cases there may be circumstances which lie behind large leaver numbers and reweighting impacts which alone are not clear from the data. Now read the rest of Datalab’s ‘Who’s left’ series of posts. Research was carried out by Datalab’s Philip Nye and Dave Thomson. 1. Only institutions attended by more than five children full-time, or one child with special needs, need to register as schools – and as Ofsted found, there may also be places that should be registered but are not. 2. 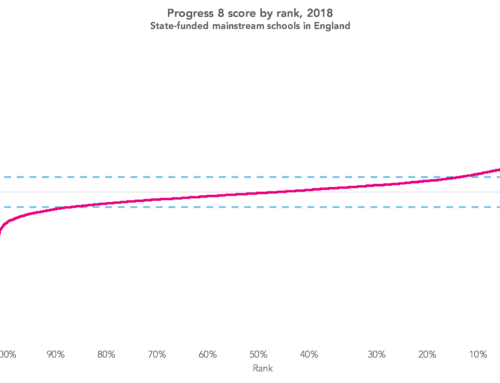 Results are lower in general, as we are effectively adding back in pupils who left the rolls of mainstream schools to alternative provision, special schools and other destinations (albeit only to the extent they spent time with a mainstream school). The impact across all mainstream schools is to reduce results by 1.6 percentage points. 3. Only schools that had a simple, one-to-one relationship between a predecessor maintained school and the academy were included. I think it is important that these findings are not used to infer that children who are Home Educated do not get good GCSE’s which is how some might choose to use these stats. These stats are to do with young people leaving school in year 11. If a child is withdrawn from school BY THEIR PARENTS at that age the chances are that there are multiple issues: bullying, anxiety, mental health issues, illness etc, which have led to the decision . Therefore the chances of those children going on to get 5 good GCSE’s in the next 6-12 months is very low. It does not however mean that they never will make academic progress or make their way in life. Neither does it in anyway represent the educational outcomes / exam success for the majority of Home Educated young people, where wider research suggests that they generally do better than their school peers, on average. What these figures do show is that schools are failing large numbers of young people but not being held to account for it. Thanks for the comment, Jo. One thing to bear in mind is that we’re looking at leavers at any point in a child’s secondary education up to Year 11 – not solely those who leave during Year 11. I didn’t read it as implying anything negative about home education. I think it’s important to note the distinction between parents who make a positive choice to home-educate their children, and those who do it as a last resort when they feel like the school is not meeting their child’s needs as it should do (eg around bullying, behaviour, illness) – the second group is likely to see much lower outcomes than the first. For me, the much bigger worries are children *missing* education – those who either just disappear, or are eased out by the school but without going down the formal exclusion route. Obviously a lot of the children in the ‘Other’ group will not go on to take formal qualifications at all, so it is no surprise that as a group their results are very low. What is really needed is a more detailed breakdown into (a) independent selective schools, (b) independent special schools and other non-mainstream provision, (c) home educated, (d) missing education and (e) moved abroad or died – but that is a much bigger piece of work! It would be interesting to see how many of the 20,000 “Other” group are GRT pupils. While we find a large number disappearing from role at the transition from primary to secondary, the numbers continue to drop throughout secondary school. If the picture in our LA is representative of the country as a whole, this could account for 10–20% of the “Other” group. Thanks for the comment, Stephen. We didn’t take much of a look at ethnicity in our final analysis – but I agree it’d be interesting to see how many of those making up the ‘other’ total were part of this particular group.